In my earlier post about the Michael Brown killing by a police officer, I used the chart for St Louis, MO because the incorporation data for Ferguson was not available. A kind reader has informed me that astro-columnist Matthew Currie has published the data. Because Currie dismisses asteroids, he misses the Pallas connection I've published nearly a thousand mini-case studies about (in this blog and in my site linked above). After doing a few hundred of these case studies on Pallas, I concluded years ago (based on the data and not on wishful thinking) that Pallas rules the "libertarian" Non-Aggression-Principle. If Pallas is strong on your chart, you never strike first and you only do so for defensive purposes. When certain planets (particularly Pluto) form a transiting aspect against Pallas on a natal or progressed chart, that non-aggression ethic is weakened or put to the test. I continue to publish case studies on Pallas on this blog, and each one only strengthens the "libertarian Pallas" premise. 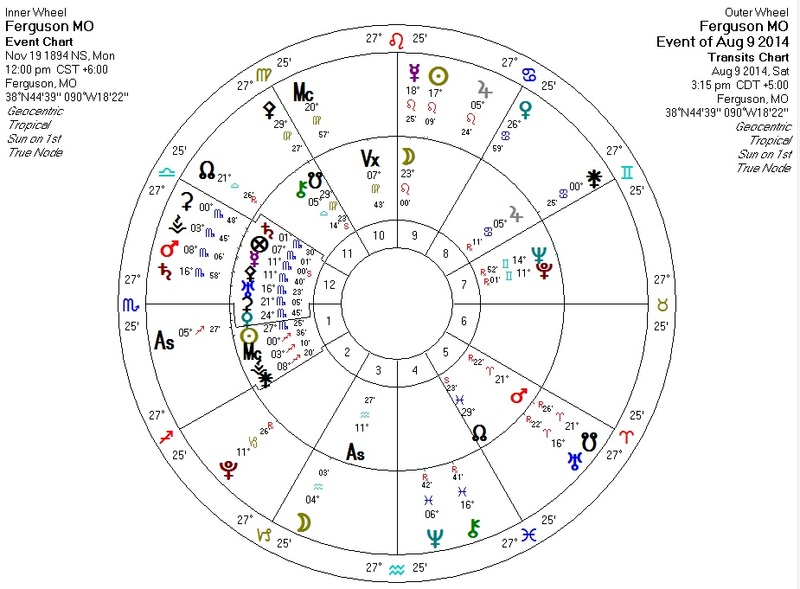 Currie does a good job describing the standard astrological action in the chart for Ferguson during the Brown killing. I'll leave that to him, and encourage my readers to peruse his article. Here's Currie's Ferguson chart, with the transits for the Brown killing on the outside. Note that transiting Pluto is sextile with Ferguson's Pallas. Transiting Pluto is also quincunx Ferguson's own Pluto which happens to be the ruler of Ferguson's Pallas. Because Ferguson's Pallas is "natally" configured very strongly with Pluto, and because Ferguson's chart also contains the rest of the Bloodbath Formula (Pluto rules/quindeciles the Sun and Venus, the Pluto-ized Sun rules the Moon, and Neptune is conjunct the ruler of Venus), I consider some bloodshed to have been extremely likely during the current Pluto transit in Ferguson. I'm grateful it hasn't been worse. As a "bonus", note that transiting Pallas is conjunct Ferguson's South Node... with Pallas as ethics and the South Node as loss or weakness, you can see another way in which Pallas figures into the Brown killing.